Location: Macroom, County Cork, Ireland. Ownership / Access: Office of Public Works. Notes: Castle Donovan or Castledonovan or O'Donovan's Castle refer to the remains of an Irish tower house or túrtheach, in a valley near Drimoleague, of medium size which was the so-called "seat" of the Clann Cathail sept of the O'Donovans for a period during the 16th century. 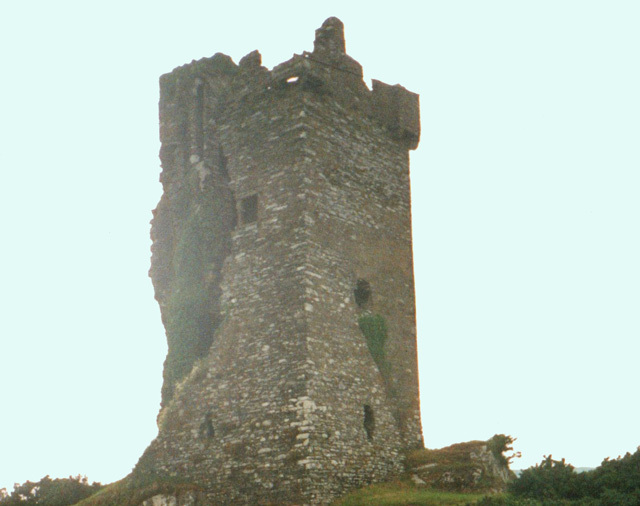 The original name of the castle, and when the O'Donovans were actually living in it, was Sowagh (or Sooagh, Suagh) before the 17th century. The name of Castle Donovan, after the Manor of the Castle of O'Donovan, is associated with a regrant from James II of England in 1615. Approximately 60 feet in height, it sits on a large rock or outcropping, which forms the ground floor, close to the bank of the River Ilen. It is commonly believed to have been built, or at the very least augmented, by Donal of the Hides, Lord of Clancahill from about 1560 to his death 1584. His son Donal II O'Donovan then repaired or further altered the structure some decades later, but was not living in it by then. It is believed that his father had already relocated the family in the first decade of that century to the more profitable Rahine Manor on the seacoast to protect their maritime interests. The tower's surrounding wall or bawn and outbuildings are now gone, but over two thirds of the tower still remain. The 17th century explosion left only a small gouge in the southwest corner, but caused huge cracks in the masonry, leaving the structure unsafe, and over two centuries later the entire western wall, excluding the still intact spiral staircase, and majority of the southern wall collapsed. It underwent conservation by the Office of Public Works between 2001 and 2014 and is a listed National Monument.